Another process that helps axons to find their targets is fasciculation, whereby the neurons that develop together intertwine and form bundles. Because the surface area of the extracellular matrix is limited, this enables several neurons to literally pile on top of the one that is advancing across the substrate. Fasciculation is made possible by the expression of molecules on the surface of the neurons’ membranes, called cell adhesion molecules (CAMs). The CAMs on neighbouring axons interact so that they can adhere to one another and grow toward their target as a group. The growth cone is the ameboid structure that is located at the tip of a growing axon and that pulls it forward. The growth cone moves through a sequence of phases: protrusion, adhesion, and contraction. To protrude in the right direction, the growth cone depends on complex cellular machinery that responds to molecular signals received from the environment by specialized receptors. For example, we know that it is the polymerization of actin that causes the growth cone to advance, and that the biochemical cascade that triggers this polymerization involves Rho GTPases. At the centre of the axon that elongates behind the advancing growth cone, a cytoskeleton made of tubulin proteins forms. Vesicles travel along these microtubules and fuse with the growth cone’s membrane to let it expand. 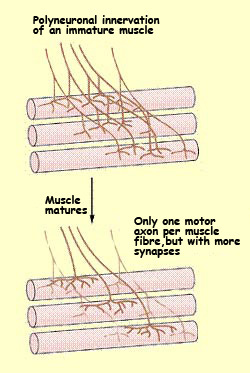 The axon’s growth depends on the molecular interactions between its growth cone and its substrate. One of the main components of this substrate is the extracellular matrix, composed of fibrous proteins in between the cells. Through this matrix, axon growth paths are marked by permissive proteins such as laminin. Laminin binds with molecules called integrins on the growth cone membrane to encourage the growth cone to advance in the right direction. The substrate also contains other, repellent proteins that control the axon’s elongation even further by preventing it from growing in certain other directions. Thus the elongation of axons is controlled by molecular “direction signs” all along the routes that they travel. One of the great challenges for the neurons in the developing human motor and sensory nervous systems is to ensure that adjacent points in the peripheral parts of these systems are represented by adjacent points in the centres where their signals are processed in the brain. The growing axons organize themselves with uncanny accuracy, forming precise topographical maps such as the motor homunculus and the somatosensory homunculus, and for some time, researchers have been investigating how they do so. In the early 1960s, following experiments on the visual pathways of frogs, researchers hypothesized that there was a chemical affinity between molecules on the growth cones of the various axons and other molecules on the target cells that these axons had to reach. In other words, it was somewhat as if each axon from the peripheral nervous system received a chemical label that told it which position to head for, while a complementary label on the target cell enabled each axon to find and reach its assigned position. But this hypothesis of a “key-in-lock” type of correspondence, where there would have to be just as many different types of keys and locks as there were different positions, was contradicted by the experimental data. In fact, other experiments have how shown that there is indeed a correspondence between some molecules on the growth cone and others in the target structure, but this correspondence is achieved by a concentration gradient that uses only one set of keys and locks. The molecules that guide the growth cone can be either diffusible or non-diffusible (cell adhesion molecules (CAMs), for example, are non-diffusible). Among those diffusible molecules that guide the growth cone by chemoattraction, the group that has been best characterized is the netrins. These molecules are secreted by the target cells, diffuse into the extracellular environment, and influence the growth cones of certain axons over long distances. Netrins resemble the CAMs such as laminin that are found in the extracellular matrix and that guide the growth cone by direct contact. Like the laminins, the netrins influence the growth cone by binding to specific transmembrane receptors that transduce their signals. 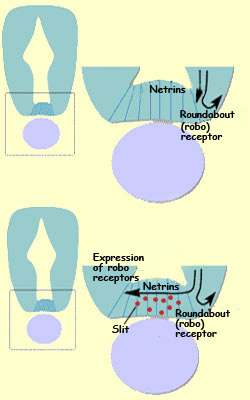 In the developing embryo, netrins are often secreted near a point where axons have to choose whether to stay on the same side of the midline or go across it. For example, we now have good descriptions of the role of netrins in the development of the spinothalamic tract, which relays information about heat and pain stimuli from the periphery to the thalamus. Netrins also help some axons of the central nervous system to cross the midline (for instance, in the corpus callosum and the optic chiasm). Molecules that guide the growth cone by chemorepulsion can be either non-diffusible (bound to the cell membrane) or diffusible (secreted by the cell and diffused into the extracellular environment). 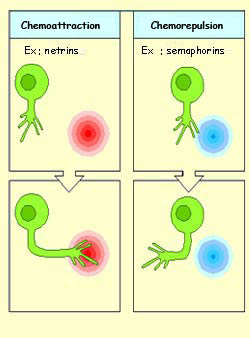 Semaphorins are one family of molecules that guide the axons’ growth cones by repelling them. The molecules that guide axon growth are not attractive or repellent in and of themselves. Instead, they acquire one or the other of these characteristics depending on the type of receptor expressed by a particular growth cone. Just as in synaptic transmission and many other processes that trigger cascades of biochemical reactions, it is the electrochemical affinity between a molecule and its receptor that sets in motion the internal mechanisms that will cause the growth cone to change. Thus, the well known guidance molecule netrin-1 attracts the interneurons of the dorsal commissure but repels certain classes of motor neurons. A given guidance factor can thus be interpreted in two completely different ways by the growth cone, depending on what type of receptors it expresses on its surface. To continue with our example, once the netrins have attracted the interneurons’ growth cones into the medial ventral portion of the spinal cord, these growth cones begin to express more roundabout receptors (or robos). These receptors are sensitive to a repellent factor called Slit that is also secreted in the medial ventral region of the spinal cord. Consequently, the growth cones then begin to turn away from this region, which causes them to continue across the midline. In this example, the cells on the midline of the spinal cord that secrete these various guidance molecules act as intermediate targets, initially attracting the growing axons, then repelling them toward their final targets. NGF is produced by the target cells of the sympathetic nervous system. If this system is neutralized by the injection of specific antibodies, the sympathetic ganglia degenerate completely. The same thing happens if axoplasmic transport is interrupted: the neurons die despite the release of NGF by the target tissue. NGF is a protein that contains three sub-units, designated alpha, beta, and gamma. The gamma sub-unit has proteolytic enzymatic properties. The alpha sub-unit inhibits the protease. The beta sub-unit is responsible for biological activity. NGF resembles other growth-promoting proteins (such as insulin), which suggests that they come from the same family of molecules. There are many other neuron growth factors; for example, motor neurons do not respond to NGF. Over a long period that begins at birth and lasts until adolescence, the number of neurons and synapses that each individual is born with decreases quite substantially. This neuronal death is the result of a competition for trophic factors that are secreted in limited amounts by the neurons’ target cells. The first of these trophic factors to be discovered is a peptide called nerve growth factor (NGF). It was discovered in the early 1950s by Italian developmental biologist Rita Levi-Montalcini. She was awarded the Nobel Prize in Physiology or Medicine for this work jointly with American biochemist Stanley Cohen in 1986. NGF is recognized by the sympathetic axons, which transport it back up to their cell bodies, where its molecular interactions promote these neurons’ survival. The way that NGF and other neurotrophins promote survival is by blocking a genetic program contained in each cell that would otherwise cause it to self-destruct, a process called apoptosis (for more on apoptosis, follow the Tool Module link to the left). Unlike necrosis, an accidental process of cell death that causes inflammation, apoptosis is a methodical disassembling of the cell’s components that takes place gradually. This process of programmed cell death allows an optimal configuration of the brain’s wiring by a) selecting those cells whose connections have proven the most efficient, b) balancing the numbers of presynaptic and postsynaptic neurons, and c) eliminating neurons that are malformed or damaged. Not all of the various neurotrophins act on the same neurons. NGF, for example, enables the survival of the parasympathetic neurons, while BDNF enables that of neurons in the sensory ganglia, and NT-3 that of both of these neuronal populations. The selective action of the neurotrophins is attributable to a family of receptors called Trk receptors, thus designated because these proteins were initially identified as receptors capable of activating the enzyme tyrosine kinase. 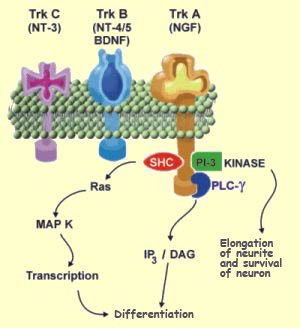 The family of Trk receptors for neurotrophins includes: TrkA, which is a receptor mainly for NGF; TrkB, which is a receptor for BDNF; and TrkC, which is a receptor for NT-3. Given the close structural similarities among the various neurotrophins on the one hand and among the various Trk receptors on the other, there is a certain amount of cross-activation among them. Thus, under certain conditions, NT-3 can bind to and activate TrkB receptors. The positing of an epigenetic form of evolution that takes place through the selection of synapses has given rise to many debates on the possibility that a sort of “neural Darwinism” somehow continues the process of the genetic evolution of biological species, but at the level of the individual and, consequently, of the social group. Some scientists, such as biologist Richard Dawkins, have used the term “memes” to designate these selected cognitive states that can be transmitted from one individual to another. Memes would thus be a full-fledged form of life whose substrate consisted of the human brain. In the course of development, long before any neuron growth factors are secreted, a large number of molecular inductions occur. This is what happens when one group of cells influences the development of another by secreting morphogenic substances. For example, the formation of the neural plate from the ectoderm is induced by the cells of the mesoderm. These induction factors, most of which have some similarities to growth factors, act by stimulating receptors in the cell membrane, which influences the activity of certain genes involved in cell differentiation. Various induction factors can be secreted in succession to induce different stages of differentiation. Or alternatively, a single induction molecule can be diffused into its environment to create a concentration gradient, just as chemotrophic guidance factors do. In this case, exposure to differing concentrations of the same substance can also result in differentiations into distinct types of cells. When the growth cone of an axon comes into contact with its target cell, it flattens and forms a synapse with this cell. When the axon is from a motor neuron and the target cell is a muscle fibre, this synapse is called a neuromuscular junction, and neuromuscular junctions are the kind of synapses whose formation mechanism we know the most about. At the same time, factors secreted by the target cell (in this case, the muscle cell), will stimulate the entry of calcium ions into the growth cone. This will have several effects on the presynaptic ending, one of which will be to alter its cytoskeleton so as to give the presynaptic button its flattened shape. The influx of calcium ions will also promote the release of neurotransmitters. A few weeks later in the embryo’s development, this rudimentary form of synaptic transmission will produce a synapse that is capable of transmitting neural activity. 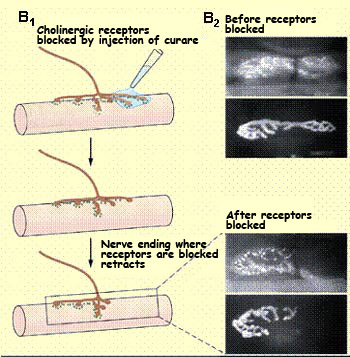 In the striate muscles of vertebrates, cholinergic receptors are confined to the motor end plates, where the density of receptors can be as much as 20 000 per square micrometre, compared with scarcely 50 elsewhere on the muscle fibres. If we sever the motor nerve that innervates a muscle fibre and let this nerve degenerate, the receptors will become more densely distributed throughout the muscle fibre but never so densely as they originally were at the motor end plate. And if the muscle becomes innervated again, the receptors that appeared away from the motor end plate will disappear, leaving only those inside this region. Experiments have also shown that even when the acetylcholine receptors at the neuromuscular junction are blocked with an antagonist such as curare, polyneuronal innervation of a single muscle fibre persists. Similarly, if the emission of action potentials from the motor neurons is blocked with a sodium-channel blocker such as tetrodotoxin, no reduction in innervation occurs. These experiments clearly show that the process by which various axons compete with one another to connect to a particular target cell is regulated by the electrical activity of the presynaptic and postsynaptic partners. Indeed, the subsequent stages of the synapse’s development will also depend on neural activity. This activity will significantly influence the competitive interactions among neurons. These interactions do not actually involve a “winning” axon’s crowding out “losing”ones. What happens instead is that the specialized postsynaptic structures associated with certain axons gradually disappear, thus reducing the electrical activity between these axons and the muscle cells and further encouraging the loss of receptors on these synapses. This process would naturally cause the axons in question to retract and atrophy. In parallel with the adjustment of the size of the populations of presynaptic and postsynaptic neurons, synaptic reorganization thus represents the final step in establishing the circuits of the brain. And contrary to the preceding steps, neuronal activity and synaptic transmission thus play an essential role in the fine-tuning of the neural networks. The fact that mechanisms of competition and elimination of synapses come into play in the course of development had been known for several decades, but the idea that this elimination could take place epigenetically, controlled by network activity and by “Darwinian”mechanisms, was first articulated by Jean-Pierre Changeux and his research team in 1972. The pioneering studies by Changeux and Danchin revealed that at the start of development, each muscle fibre is innervated by axons from several motor neurons, but by adulthood, it is innervated by the axon of only one. Similarly, each Purkinje cell in the cerebellum is innervated by only one climbing fibre, and the neurons of the visual cortex, which initially receive connections from both eyes, eventually retain connections from only one eye or the other. Mammals have two types of muscle fibres, which can be distinguished by their colour and the speed at which they contract. Fast-contracting muscle fibres are pale in colour, while slow-contracting fibres are darker. “Fast-twitch” fibres are involved in phasic contractions, while “slow-twitch” fibres are more involved in postural adjustments. Researchers have also found that the motor neurons that innervate fast-twitch muscles conduct nerve impulses very rapidly and can emit action potentials at high frequencies (30 to 60 impulses per second). In contrast, the motor neurons that innervate slow-twitch muscles conduct impulses more slowly and can generate only 10 to 20 action potentials per second. There is thus a clear correspondence between the type of motor neuron and the type of muscle fibre. It is known, for example, that newborn kittens have only slow-twitch muscle fibres, and that these differentiate into fast-twitch and slow-twitch fibres during the first few weeks of life. This raises the question of whether it is the muscle fibres that induce the correct type of corresponding motor neuron, or whether it is instead the neurons that, by innervating the muscle fibres, somehow tell them what kind of muscle fibre to become. To answer this question, experiments were conducted in which fast motor neurons were surgically reconnected to slow muscle fibres, and vice versa. These experiments showed that the latter hypothesis is correct: it is the nervous system that controls the contraction speed of the muscle fibres that it innervates. This implies that the motor neurons are capable of influencing the expression of the muscle fibres’ genes, because the contraction speed of a muscle fibre depends on different versions of myosin light chain fibres. Part of the reason for this remarkable phenomenon might be that the differing activity patterns of the two types of motor neurons have distinct differentiating effects on the muscle fibres.